Zack Chakonis wrestles with an opponent. The New Jersey native was victorious in a major win for NU. The message was clear. In the immediate aftermath of Northwestern’s 25-12 win over No. 24 Illinois, senior Zack Chakonis wanted one thing known: Don’t mess with Jersey. Of the seven Wildcats wrestlers who won matches Friday, three of them are from New Jersey: sophomore Sebastian Rivera, the top-ranked 125-pound wrestler in the country; senior Johnny Sebastian, who earlier in the dual recorded a 10-5 decision over Illinois wrestler Carver James; and Chakonis, whose fall over Andre Lee was his first of the season. In a rare victory against NU’s interstate rival, it was the boys from Jersey who led the Cats (4-10, 2-7 Big Ten) to a win over the Fighting Illini (2-9, 1-9). Chakonis, who won on Friday by flipping Lee on his back 30 seconds into the start of his matchup’s second frame, said being from New Jersey is an identity. More than just a geographical fact, it’s a mindset. 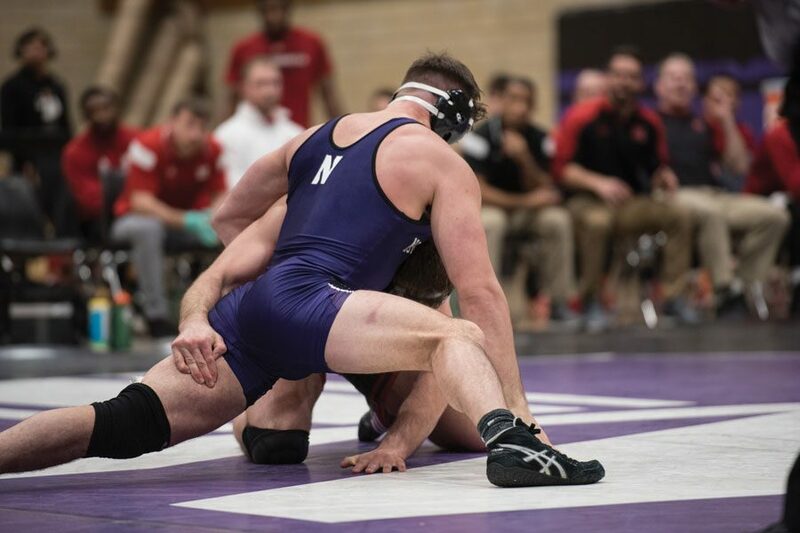 After Chakonis’ win in the 197-pound weight class put NU up 6 points, the Cats never again trailed in the dual. Senior Conan Jennings and Rivera won their next matches to put NU 13 points ahead with two matches left. By earning just their second win against a Big Ten opponent all season, the Cats beat Illinois for the first time in nine years. Last season, NU lost to Illinois in an 18-17 heartbreaker, which ended its hopes for an undefeated campaign in the seventh match of last year. Rivera won his match in dominant fashion, taking down Carter James 10-5 after falling behind 5-4 in the second frame of play. He won a quick reversal to take a slim lead into the third period and never trailed again. In the midst of a season marred by injuries and inconsistency, Rivera said his match win was an important confidence boost and morale builder. For coach Matt Storniolo, the dual win was especially important because of its proximity to the national tournaments. Storniolo said Friday’s win reversed much of the frustration he felt after close losses to Illinois in two of the last three seasons. With the postseason less than three weeks away, the Jersey boys live to fight another day having dominant wins on the eve of their postseason tournaments. Rivera said the trio’s performance is emblematic of the state’s wrestling prowess.